The seventh edition of the most exciting wine event in South Eastern Europe – SuperWine – will take place in the luxury yacht marina Porto Montenegro on Saturday 29th June. This year, more than ever, SuperWine has carefully selected each winemaker and taken care of every detail in order to provide one more wine spectacle to remember. 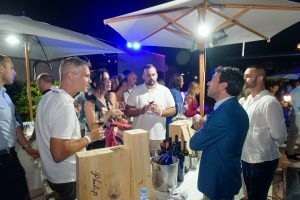 With the leading European and regional wineries, the luxury exuding from every corner of Porto Montenegro, the guests from around the world, and the stimulating entertainment program, SuperWine 7.0 is once again promising to reinforce its leading position among the wine events in this part of Europe. The exclusive wine salon, DJ performances, and culinary zones, without doubt, mean we can announce yet another really Superb SuperWine.